Red carpet. Bright lights. The glow of the Golden Globes emblazoned archway. 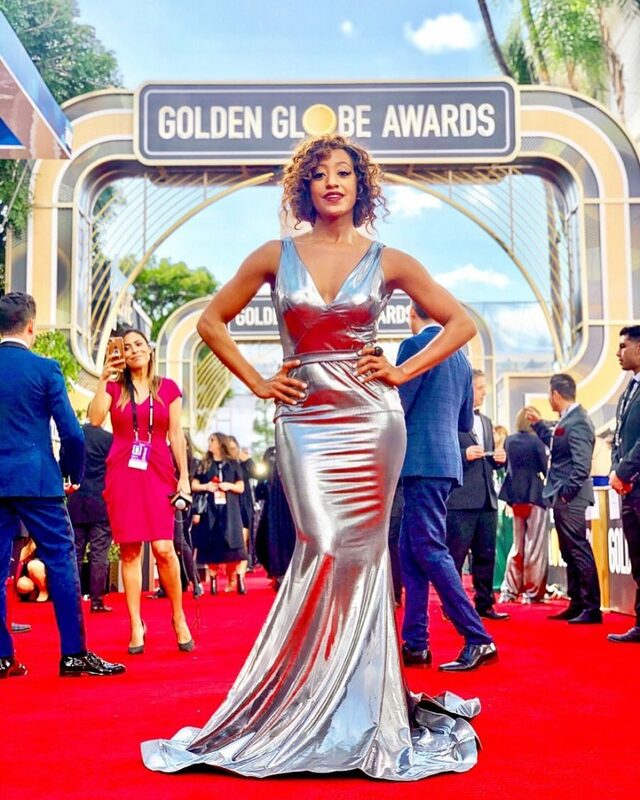 It was time for the first major awards show of the season – the Golden Globes – and in just a few hours after I stepped on the carpet, it would open up to a flood of celebs ready to take on interviews at the dozens of outlets on hand. 2:28 p.m….2:29 p.m….2:30 p.m. “Hi, would you like to speak to…?” a publicist said as she approached me. So, what was it like to be in the mix at the Golden Globes and the events leading up to it for Golden Globes weekend? Unforgettable…and I’m taking you back inside to give you the full rundown. Take a peek inside what went down on Golden Globes night and the hottest events leading up to it. Rule number one at the Golden Globes: Keep your cool. While it might be tempting to grab a selfie or pop in the background of a celeb’s photo a la the FIJI water girl, it’s important to remember to act like you’re supposed to be there. 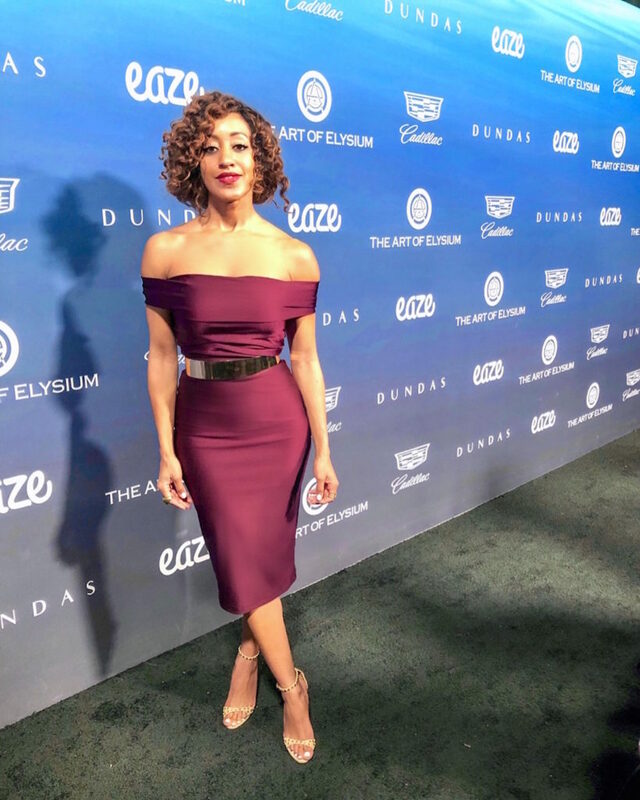 It’s a room full of industry peeps, so the majority of attendees keep a level head, even as they cross paths with Halle Berry, Nicole Kidman, Lady Gaga, Anne Hathaway, Lupita Nyong’o, Denzel Washington, and many others throughout the day (as I did). As for Golden Globes day prep, the day usually starts very early, with just about anyone who goes to the carpet and/or show (media, celebs, and attendees alike) all getting prim and proper beforehand with makeup and last minute hair touches before they hit the red carpet. Things go up a notch when you’re a member of the media on the carpet. 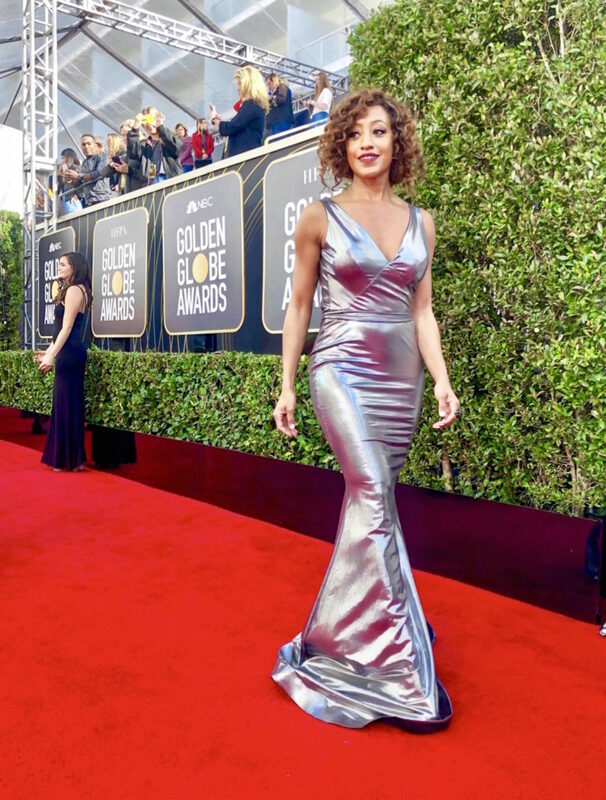 After borrowing a body hugging metallic silver dress from Jessica Angel Collection earlier in the week, I was up at 3 a.m. wrapping up posts from Saturday’s pre-Globes BAFTA Tea Party and Art of Elysium bashes. At 8 a.m., I was getting my make up done by Dion Xu, and after prepping more questions for celebs, I was on my way to the red carpet at the Beverly Hilton by 11 a.m.
Three hours later the carpet began at 2:30 p.m., and celebrities started to arrive. During the nearly 3-hour carpet, publicists approach media to ask if they’ll speak to their clients, or media members yell out to publicists to try to get them to bring their clients over. Interviews soon begin. I chatted with Rosamund Pike, who wowed me with her structured black Givenchy dress and metallic jacket, the ever-charming Rachel Brosnahan who glowed in a yellow dress ahead of her win, and Ben Stiller and his daughter Ella about their fun-filled Globes morning together at Chateau Marmont, among many others. Those were just three of about two dozen interviews that I did that day. During the last hour of the carpet around 4 p.m., more megastars arrived. Berry flashed a wave at the Globes fan station, while Emily Blunt and John Krasinski held hands, and Gaga gave a whole mood with her endless periwinkle train during the last hour of it around 4 p.m. (there was an assistant on hand just to carry her train). Meanwhile, Nicole Kidman and her hubby Keith Urban per usual held hands and embraced each other all the way down the carpet. Once the carpet wrapped, everyone either headed inside the hotel to one of the viewing parties, inside the actual show, or to the media room. Inside the HFPA Golden Globes Celebration viewing party, guests sipped champagne, noshed on pasta and sliced roast beef from a carving station, and stepped in front of an illuminated frame to capture their perfect afterparty snap. There are Golden Globes after parties, and then there is the Golden Globes after party. The annual InStyle & Warner Bros. HFPA afterparty is one of the most sought after bashes of the night and just about every big name at the Globes pops in (after making a style statement inside of the signature InStyle elevator video station). Lupita NYong’o, Danai Guerrera, and Michael B. Jordan arrived together for example (just as they did on the carpet), heading inside to party with the likes of Blunt and Krasinski, Kate Beckinsale, a Globe-toting Regina King, and Taylor Swift. (See my post about it for InStyle, here). 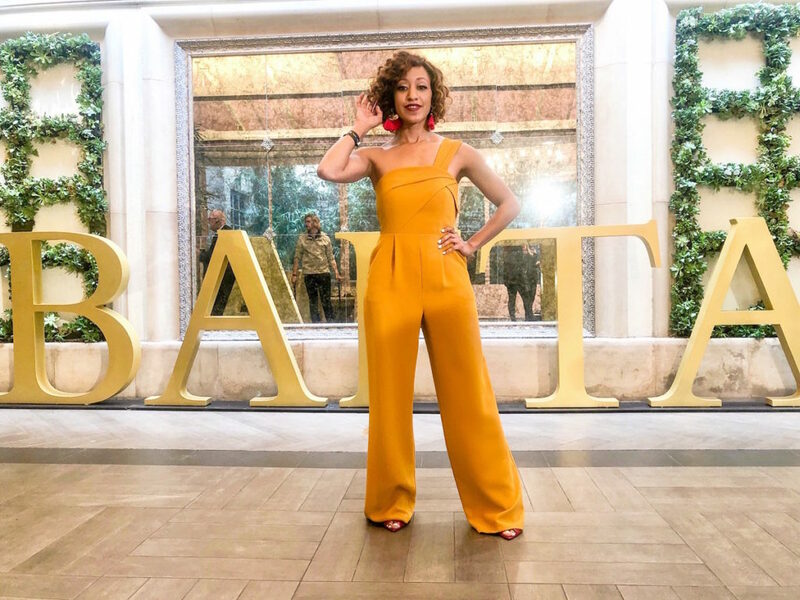 Inside, a DJ kept guests dancing under the glow of gold balloons to hip hop hits like Travis Scott’s Sicko Mode and Beyonce and Jay Z’s “Apesh*t.” Jenna Dewan and Constance Wu hit the open bar, grabbing cocktails and glasses of champagne, while others munched on the In N Out sliders and tater tots at one of the food stations. You didn’t really think celebs went home after the #GoldenGlobes, did you? Swipe to see behind-the-scenes pics from the #InStyleWBGlobes after party. When they finished partying, attendees hit the coffee bar right outside the doors, and took home Maybelline goodies from the bathroom, which doubled as a glam makeup and hair touch up station (with makeup and hair artists stationed inside). Before partygoers fully called it a night, they stopped by the Rollasoles vending machine and swapped out their heels for gold portable flats to give their tired feet a rest. I definitely grabbed a pair too. This is one of the events leading up to Globes night that celebs look forward to the most. 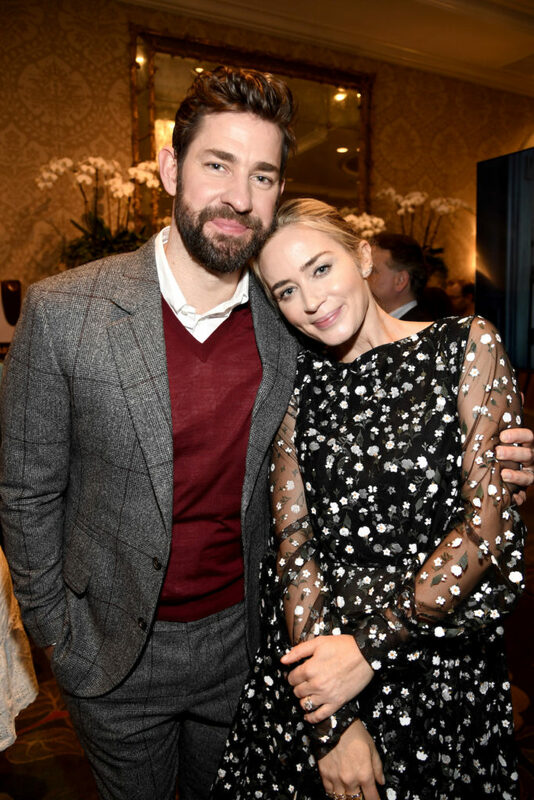 It’s a laid back event with a no-selfie rule, where Emma Stone, Laura Harrier, Lupita NYong’o, Regina King, Amy Adams, John Krasinski, Emily Blunt, and more mixed and mingled in an intimate ballroom at the Four Seasons Hotel in Beverly Hills. If there were any very LA tea party in town, it would be this one. Stars come glam and it’s more about munching on crumpets with champagne and cocktails than cups of tea (although there are three varieties on hand). Isla Fisher, for example, hit the carpet with her hubby Sasha Baron Cohen in a gold sequined Greta Constantine dress, while Blunt stunned in a black and white Oscar De La Renta floral dress paired with yellow stilettos, and Thandie Newton gave us all the life in a strappy leather crop top paired with a high waist a-line skirt. Inside, no one acts starstruck that they’re in a room full of celebs, because everyone in the room for the most part is in the industry. So, it’s a day when Globes nominees and their fellow actors and filmmakers alike get a chance to kick back, share a laugh, and catch up before the real craziness of Globes day begins. In one part of the room, for example, Brosnahan was casually munching on a tea sandwich, while NYong’o hung out with Kiki Layne and her Black Panther costar Danai Gurira, and others toasted champagne, cocktails, and the occasional cup of tea. Emma Stone and Laura Harrier arrived later in the day, with the Oscar winner asking a friend “is it fun?” before strolling inside in a bird-printed dress. 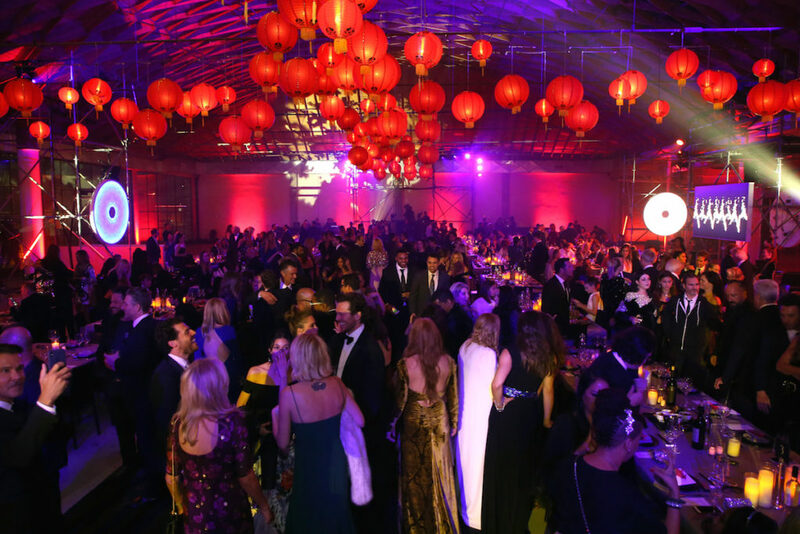 This Saturday night star-studded event on the eve of the Globes made us say ‘wow’ when we walked inside. Emily Ratajkowski whipped around the red cape of her plunging dress as she and other stars like Jennifer Garner, Wilmer Valderrama, and more, enjoyed signature Ketel One cocktails and champagne in a blue lit cavern of sorts. It was evening of fashion in the main room thanks to a runway show by Peter Dundas, with guests taking seats to watch the show and enjoy a family style dinner under the glow of orange japanese lanterns in a separate space. 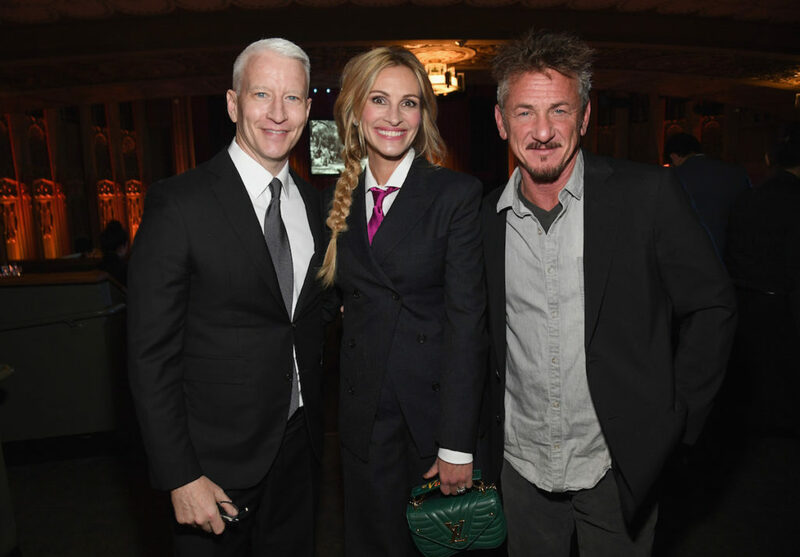 Leonardo DiCaprio is just one of Sean Penn’s friends who make it a point to attend this intimate charitable event every year. 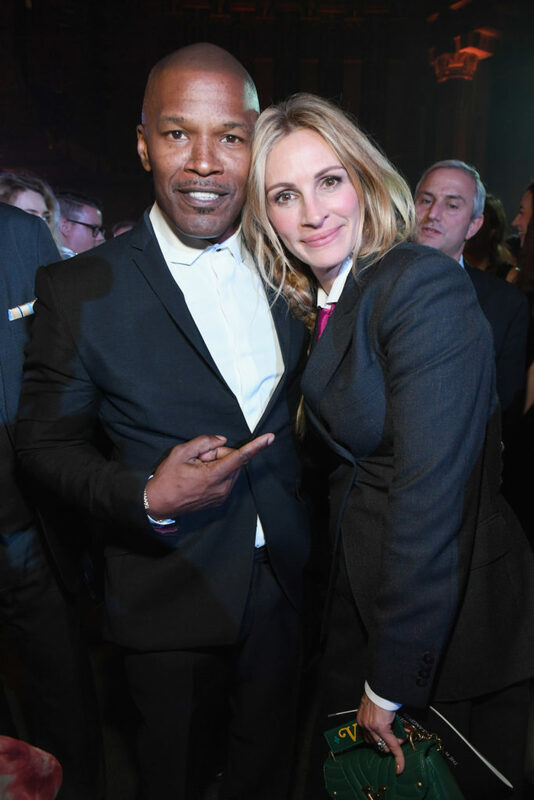 Jamie Foxx hosted the festivities for Penn’s annual J/P Haitian Relief Organization fundraising gala at the Wiltern Theater this time around Saturday night, with Anderson Cooper among the honorees and Julia Roberts among the attendees. Guests sipped special Casamigos cocktails and enjoyed performances by Macy Gray, Billie Eilish and Yusuf Islam. The event raised $3.5 million dollars from the live auction for the charity, which aids Haiti relief efforts. Stay tuned for more insider details from the SAG Awards, Grammys, Oscars, and more!